Verizon's ever popular Backup Assistant may have finally come out of the caves and onto the scene for some BlackBerry owners, but it sure won't stop one service that has long been able to sync the address book and other items that all BlackBerry owners keep close to their hearts. 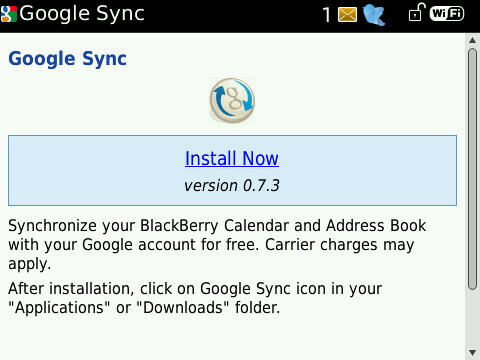 Google Sync for BlackBerry recently got spotted with a new update that brings it to version 0.7.3 – which looks to only offer some minor bug fixes and nothing else. Still, it does offer some additional benefits that Verizon's Backup Assistant is lacking in certain departments such as calendar sync so your 6 months of calendar preparation won't result you in having to manually input each one from scratch in the event something tragic occurs on your smartphone. Even though it may not be accompanied with a change-log to let users know any of the new things it brings forth, it would still be wise to download this update simply by pointing your browser to m.google.com/sync.